A place to find all of the fresh news related to No Man's Sky. Save File Issue ALL NMS Experimental Players NEED to know before 1.38 hits! Howdy folks, this is just a quick PSA regarding the upcoming No Man's Sky Patch 1.38 update. I imagine many of you play the experimental version of the game but may not always keep a very close eye on the message boards, so thought I'd just whack this out to give as much warning as possible. As stated by the Hello Games developer HG_Hohbes, Patch 1.38 will be hitting the experimental BETA players this week, this wouldn't normally be any kind of issue except this patch focuses primarily on overhauling how save files work. Click the above image to be transport through the interwebs to the official post! The patch will cause your game to make a backup of your current save files then convert to the new far more user-friendly system. 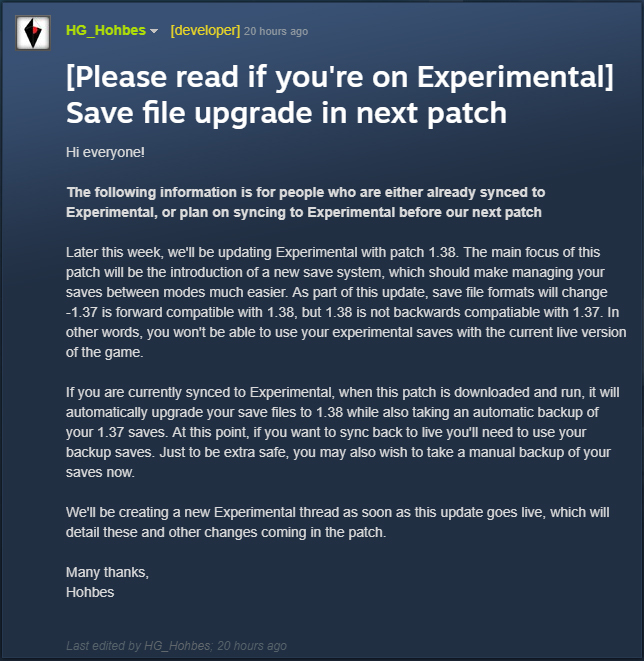 This could be an issue for some as while your 1.37 save files can be converted to 1.38, any save files from 1.38 cannot be converted back meaning that any progress you make during the 1.38 experimental version and beyond cannot then be continued by switching back out of the experimental version of the game. If you have no intention of switching back to the live version of the game before the full 1.38 update is released on live then you have no issues, but if you do, you will only be able to rely on your backups negating any progress made during 1.38 while in the 1.37 live state. I've tried to word this as user-friendly as possible, but I have a tendency to explain things in a strange way, so if you are at all confused, just ask away in the comments and I'll approach it from a different angle. This is important info for anyone who plays on experimental so share this article, video or the official post to your fellow travelers and if you haven't already. Have an awesome day folks.